Apparently, Howie holds a ‘Christmas party’ at his SL home each year. In reality, this takes place over several days as not everyone is online at the same time of day, or even the same day., and the event has previously been photographed for SL Naturist. Plans are already underway for this year’s party, and it appears there will be a ‘Photo Special’ on SL Naturist this year, published on Christmas Eve. Howie invites all of his naturist friends, and apparently it’s legendary for a bit of SL ‘networking’ with new SL friendships often made. In advance of it, model Malgorzata has turned up on her bike, laden with presents to put under the tree which has just gone up. This three pose Christmas bike set is available on the Marketplace for L$50. While much of the grid is now covered in a blanket of snow, the nice thing about living in a naturist paradise like the Eden Naturist Estate is that the sun shines all the year round, and it’s warm enough to pursue the naturist lifestyle. Thanks to the Fab Free blog for highlighting this pose set. Here in the UK there’s an expression ‘all fur coat and no knickers’. It generally refers to people who have a veneer of substance and style but are impoverished in reality. That impoverishment does not necessarily refer to money either. They will buy something expensive, for show, without necessarily looking after the fundamentals. They will talk up their job as the ‘administration co-ordinator for corporate insurance for the south of England region’ when the reality is that they’re a secretary in a hardware store in Brighton whose responsibilities last week included getting buildings insurance for their single shop. The FAD Fashion Event offers a variety of free group gifts, one of which is a short fur jacket. Below, our model demonstrates that she is definitely is ‘all fur coat and no knickers’. Meeuwenstrand (it translates from Dutch as ‘Gull Beach’ or ‘Bird Beach’) is a new ‘naturist’ location to me, which has been highlighted courtesy of Howie. I’ve no idea how he discovered it, as it doesn’t turn up on any naturist searches I’ve done, but I’m grateful for the heads up. Since taking over at SL Naturist I’ve been researching as much as blogging, and the ‘tiers’ (for those who don’t know) are the weekly rental costs of having a sim (or part of a sim) and the opportunity to have your own sim build. These do appear to be quite high, Currently, an entire region costs $195 US dollars a month. Some regions might be $295 per month. That’s a lot of money, £195 per month (for the $295 region fees) or €270 (euros). Can you afford over £2000 a year to run your own sim? Doubtful. It’s a lot of ‘disposable income’ to find and justify. The price of a two week holiday for two, including spending money. There’s a lot of commitment to shell that out each month. I wouldn’t do it. I’d be hard pushed to look at tier fees of any more than something in the region of £1.oo per day, the price of a newspaper, for example. 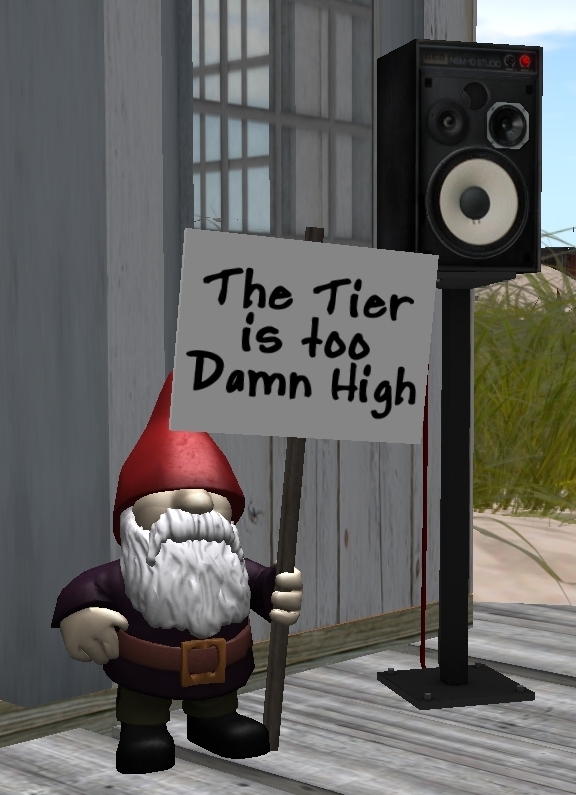 It seems to me that one of the main reasons why Second Life hasn’t exploded into the public consciousness as it should have done is the cost of tiers. With storage space allegedly getting cheaper by the day and servers cheaper, how can such costs be justified? Perhaps the sense of ‘disposable income’ is different in the US than it is to Europe, or the rest of the world. Linden Labs, who operate Second Life as a game, are presumably making profits, but you know as well as I do that we’re constantly getting in-world messages, or blogger notices, that x, y or z store is closing. Tier costs must be a prime reason, much more than people outgrowing the game. I’ve not done a lot of research on the age demographics of Second Life, other than to note that the 45-55 age group (who might have disposable income) appear to make up a sizeable proportion of Second Life’s users. ‘Sansar’ needs to encourage (other) economies by re-modelling its economy to reflect these emerging powerhouses (certainly the Brazilian and Indian markets, Russia appears to be increasingly insular and China is fairly closed as far as the internet is concerned) and get players building and developing ‘Sansar’. We need to be able to wander through multi-sims of Indian countryside, of Brazilian rain-forest, to get back to the SL I remember when I first started playing. That is, sims where ‘education’ played a role. I would agree. What is ‘disposable income’ for Americans, $295 a month, is almost 20,000 Indian rupees, for example. The average Indian wage is the equivalent of…$295!!!!! Or just shy of 20,000 Indian rupees. It’s little wonder that an emerging economy isn’t being reflected in the number of Indian based (or architecturally similar) sims on the grid. The economic disparity is also reflected in other countries’ average incomes. If western, north American or European based stores are closing because the economics don’t make sense, what chance do emerging economies have to make a mark in Second Life? We’re pretty much left to a few westerners with an interest in certain locations or cultures grasping the nettle of giving India, or Mexico, or Argentina, or central Africa a presence in Second Life. So Epoxylady, who appears to be the owner of Meeuwenstrand, is quite correct in her assessment of tiers being too high. What of Meeuwenstrand itself? My opening sentence referred to it as a ‘naturist’ beach in quote marks because it is, strictly speaking, a ‘clothing optional’ beach. The entire sim is peppered with ‘bots’, as you can see from the photos, and they’re in a variety of swimwear, or not, underscoring its clothing optional credentials. The sim, rather delightfully, acknowledges that we’re not all of a uniform size. Several naturist bots outside the cafe. What I particularly like about Meeuwenstrand is the sense of space and simplicity in the building of it. Usually, a Second Life beach means one thing -the tropics and palm trees- so it’s delightful to come across a very real and different sense of what a build should include. In this instance it’s typical Holland. Sand dunes, wind farms, pill boxes (a legacy of WW2) being an inspired piece of beach ‘furniture’. It’s also very like the English coast directly across the North Sea. A house on the coast, also typically Dutch with its stepped gable. The Marram grass is typical of sand dunes. A trawler registered in Sunderland, north-east England, ploughs the water off Meeuwenstrand. This is possibly the least realistic element of the build 😉 as the EC have pretty much destroyed Wearside’s fishing fleets over many, many years. An unexploded WW2 mine washes up on the beach 70 years later. Even this is a realistic touch, as beaches in Holland, France, Belgium and England are occasionally closed while the military blow up a mine that may have washed up. All in all, it’s a magnificent, inspiring build that so much can be achieved with so little and accurately reflect an area in doing so. It deserves recognition and a wider audience. Go visit! If you know of a naturist or clothing optional beach that SL Naturist has written about or discovered yet, please let us know and we’ll do our best to give it some publicity.